If your laser safety eyewear doesn’t fit or look fashionable, it won’t be used. Personal Protection Equipment (PPE) is not renowned for making a fashion statement. Donning a Hi-Vis waistcoat is not your passport to the trendiest of nightclubs! But then the primary purpose of PPE is safety in the workplace. However, it is this focus on function that is its failing. Because in our fashion conscious age, if it doesn’t look good chances are it won’t get used. TLM Laser is the UK distributor of laser safety eyewear for the Italian eyewear specialist, Univet. The company is innovative and internationally recognised and has won awards for its Technology Leadership. Univet was one of the first companies to introduce the concept of sport and designer eyewear into the safety sector. Its products are renowned for their comfort and style. One of the key technologies developed by Univet is the new material Sylex. 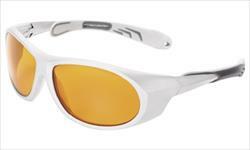 Offering complete safety and comfort and exceptionally light in weight, Sylex provides superior laser protection without the use of metal in the frame. With Sylex, operators can wear their safety eyewear in comfort throughout their shift. Of course, eyewear comfort is not only due to reduced weight. The eyewear needs to have arms that are fully adjustable and include appropriate padding such as Univet’s innovatory Softpad system. To check whether your eyewear fits properly, drop your head forward then shake it. If the eyewear stays on, feels comfortable and doesn’t pinch, then you have a perfect fit. Providing safety eyewear that meets the necessary international standards is simply not enough if your operators don’t wear it. With Univet you get the best of several worlds – all round protection, a great fit and designer style and all at an affordable price! For an online guide to finding what laser safety eyewear you need and an instant quote, use our Laser Safety Glasses Wizard here on the TLM Laser website. If you want to make a large order, contact sales@tlm-laser.com and we will arrange a Demo Box for you.